The requirements on the safeguarding of machinery have changed more and more with the increasing use of automation. 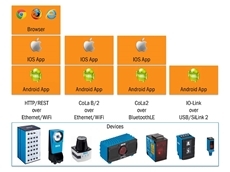 SOPASair makes it possible to identify and activate SICK sensors within a network using mobile devices. With industrial parquet manufacturing, fine wood flooring became affordable and available to anyone. The European parquet industry now produces over 80 million square meters of parquet flooring every year. To achieve this figure, there are stringent requirements for the systems used for automated wood processing: Sawdust and wood chippings are very challenging for conventional safety sensors. They are nonetheless expected to perform their tasks regarding operational safety with both reliability and precision. One of the leading parquet manufacturers in Europe, Bauwerk Parkett AG, uses the new microScan3 safety laser scanner from SICK to make a stacking robot safe. The company manufactures a large proportion of its range of 2-layer and 3-layer wooden parquet floors and sports flooring at its production facility in St. Margrethen, Switzerland. 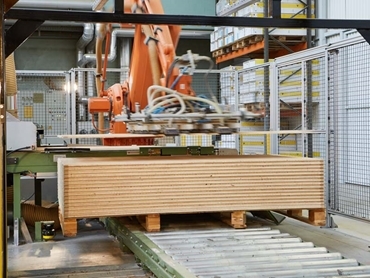 In what is known as the loading stage, the station between the parquet layer compression and the surface treatment, a robot feeds in the parquet floorboards by de-stacking them from a pallet. Due to space restrictions caused by a nearby machine, it was not possible to protect the form of doors or light grids. Since safety laser scanners, unlike light grids, also offer rear stepping detection and therefore prevent a machine from being restarted unintentionally, a safety laser scanner was already being used to make the operating area of the robot safe. This safety laser scanner occasionally reached its limits if clouds of sawdust were created when lifting or setting down the wood. “Depending on the intermediate goods process, chippings are mixed in from time to time. And even if there are only a few, they tend to accumulate over the entire pallet slowly,” explains Heinz Isele, Engineering Manager at Bauwerk Parkett. “There are up to a hundred layers on top of each other. This occasionally, especially at the end, causes a small cloud of chippings to be released when they are lifted with the vacuum system, which then triggered the scanner.” The consequence was that the availability of the system was limited. “With the new scanner, the microScan3, we were able to eliminate this issue” adds Heinz Isele. 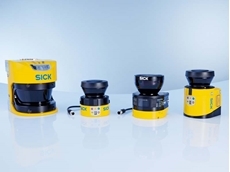 The microScan3 safety laser scanner is one of a new generation of safety laser scanners from SICK. Thanks to its innovative safeHDDM® scanning technology it is setting new standards. safeHDDM® combines a compact design and a wide scanning range in one device. The housing of the microScan3 is rugged, with outstanding reliability in dust and ambient light. safeHDDM® is based on SICK’s HDDM measurement method (HDDM = high definition distance measurement). 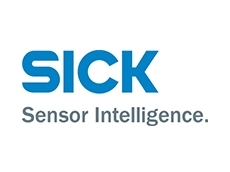 This method patented by SICK carries out intelligent filtering and evaluation to deliver a measurement result that is unprecedented by safety laser scanners. The digital filtering of the remissions resulting in a histogram accumulation suppresses random individual remissions, while remissions from coded pulse sequences of the scanner are reliably detected and evaluated even with the required low signal strengths. 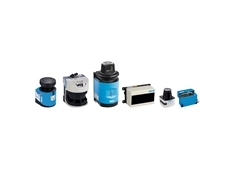 As a result, dust particles or contamination on the optical interface have a considerably less negative impact on the detection reliability and the reliable protective function. Moreover, the parabolically shaped front screens of the latest generation of safety laser scanners with safeHDDM® deflect all reflections that arrive outside of the optical path of the laser pulses and their remissions into an optical trap – away from the receiver element in the device. This also increases the resistance to dust and contamination of safety laser scanners with safeHDDM®. Many people assume that a high-performance safety laser scanner would be complex to handle and operate. However the microScan3 sets new performance standards in this respect as well. The new Safety Designer configuration and diagnostic software make configuring and commissioning the system extremely easy. Areas can be defined freely and sent to the scanner via USB. During operation, the status indicators, LEDs, and display are visible from several angles, even from a distance. Together with the user-friendly pushbuttons on the device, the status indicators on display allow for simple device diagnosis and operation at all times. “The display of the microScan3 is also graphically better, more intuitive, and offers more information than the purely LED-based display of the previous version. For example, you will now see a cleaning symbol if the front screen needs to be cleaned,” explains Heinz Isele about the additional advantages. Thanks to the use of smart connectivity and standardised M12 plug connectors, the microScan3’s cabling is not just simple – it also saves on connection costs. The device can also be replaced quickly and conveniently thanks to the integrated configuration memory in the system plug. The mounting bracket with integrated guide rails means that the scanner can be attached and adjusted with ease. Thanks to the proven light-metal die-cast housing, microScan3 achieves a high level of mechanical resistance. It protects hazardous areas at loading and unloading stations, multi-sided access points to machines and material gates, machines in harsh environments, as well as hazardous points with an object resolution of up to 30 mm. The requirements in the wood industry are diverse and exacting. Whether you are dealing with sawdust, wood chippings, or splinters – the new microScan3 safety laser scanner is impressive even when used with parquet flooring and offers maximum operational safety under harsh ambient conditions. Offering 350 parquet floors in 11 types of wood, 57 colours, with fivedifferent possibilities for surface treatment and texture for each, Bauwerk Parkett excels in providing diverse parquet options. At the same time, the company places value on the well-being of customers with its conscious choice of materials that facilitate healthy living. In its manufacturing activities, it ensures this quality by combining technical expertise with the very latest technology. Even in Bauwerk’s modern production facilities, there is no substitute for manual and visual inspections by experienced staff. Fortunately, the members of staff are well protected in the operating area of the stacking robot thanks to the microScan3 safety laser scanner, while the system availability has been enhanced thanks to the state-of-the-art safeHDDM® scanning technology.